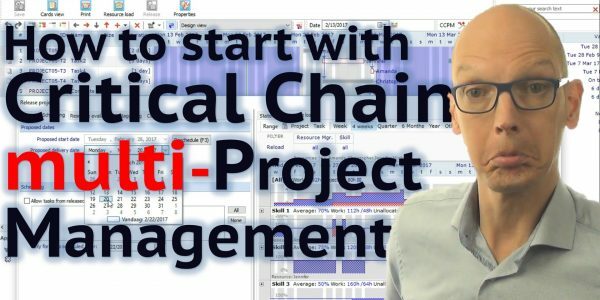 With Critical Chain multi–Project Management get into control again. See the video and download the paper, to learn how. Most problems in projects can be traced back to people who didn’t have the time to complete all their work. CCmPM is going to solve that. Projects are started too early or too often or too much. People get new work regardless their other commitments. You can imagine all the problems when people don’t have the time to do their work. Critical Chain multi-Project Management is designed to fix this. Staggering is the most important tool from the Critical Chain Project Management toolbox. The 10 Step Staggering Process it is a super simple method. To start projects early enough so people don’t need to wait. But not so early, that they get everything at once and get overwhelmed. You might be interested in our new training to learn the 10 Step Staggering Process. It consist of a easy to follow video AND downloadable training handouts (with even more backgrounds). I personally take you by the hand and step you’ll learn to stagger your projects. And you learn how to use LYNX TameFlow. Now the good news. By signing up to our Membership Community, you get free access to this training. AND you also get free access many more training video’s. For no costs at all. All we want, is to help you getting started with Critical Chain Project Management. It’s true. It is totally free. The training How To Start with multi-Project Management is part of the module How To Start with Critical Chain Project Management. Just Enjoy! Stay Tuned about our new Member Ship Programs! I like to stay tuned!